Glaucoma is an eye disease which can damage the optic nerve. It typically occurs in people over the age of 60 and those with a family history. They have a build up of pressure inside the eye which results from either too much fluid formation, or a problem with drainage. 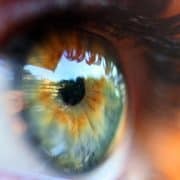 This pressure in turn damages the delicate optic nerve fibres resulting in vision loss or even blindness. There are many types of glaucoma, but the most common is Chronic Open Angle Glaucoma ( COAG ). Part of the difficulty with the common form of COAG, is that the patient does not experience any symptoms. 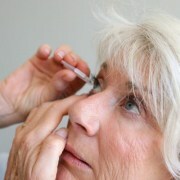 There is no pain, pressure feeling inside the eye, nor is there vision loss in the early stages. 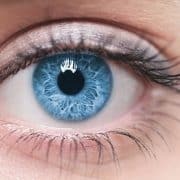 Without treatment, there will be a gradual loss of peripheral or side vision which is difficult to detect with both eyes open. In the end stages, tunnel vision results , which can deteriorate to no vision at all. The other form is Acute Angle Closure Glaucoma ( AACG ). This is very symptomatic. There is a fast and sharp pressure rise in the eye which causes throbbing eye pain, headache, redness, blurry vision and even vomiting. This is a crisis situation and you must seek treatment immediately at your eye care professional. 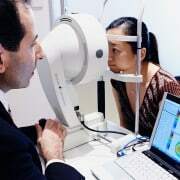 Glaucoma can be diagnosed through a complete eye examination. This involves measuring the vision on an eye chart, taking the pressure of the eye using numbing drops, and measuring the corneal thickness using a pachymeter. If narrow angles are suspected, a Pentacam image may be taken to prove this. Next, dilating drops are put into the eye which blur the vision for a few hours. With the pupils dilated, an OCT test which measures the optic nerve fibre thickness will be done. Photos of the Optic nerve are often taken. 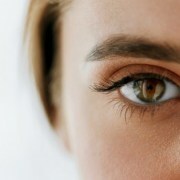 At subsequent visits a visual field test may be performed to give information about the peripheral vision. 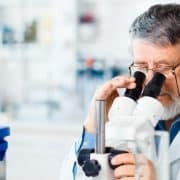 Whilst there is no total cure, there are good methods of controlling glaucoma and preserving sight. 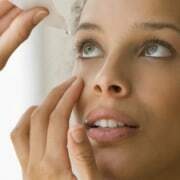 The most common treatments for glaucoma are eye drops, SLT laser treatment, LPI laser treatment or Surgery. Eye drops work as they can decrease fluid production or stimulate drainage outflow. SLT Laser treatment to the correct part of the drainage angle causes tissue to shrink and therefore opens up channels for better outflow. Over time, the effects of the laser treatment can wear off and this may need to be repeated. LPI treatment creates a hole in the iris in order to re-open or prevent angle closure and therefore minimise any damage to the eye as a result of the acute pressure rise in the eye. If either of these methods or a combination are not effective then a larger drainage channel can be made surgically. Focus Opthalmic Surgeon Dr Con Petsoglou is a leading expert in the treatment of corneal and external eye disease in adults and children.